Scans courtesy of Jack Pendergast. Click his name to visit his current ebay offerings. 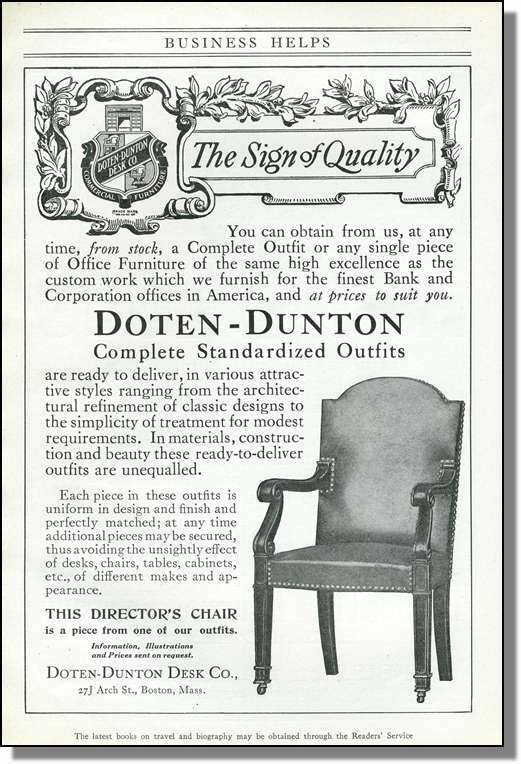 Here is an example of a 1914 magazine advertisement for the Doten-Dunton Desk Company, 25-J Arch Street, Boston, Mass. 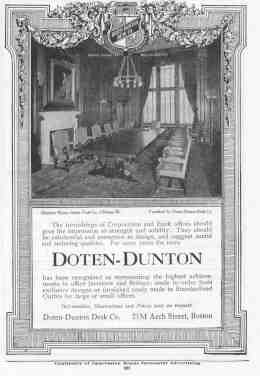 The title of the advertisement is, "Doten-Dunton: Artistic Furniture for Banks & Offices". 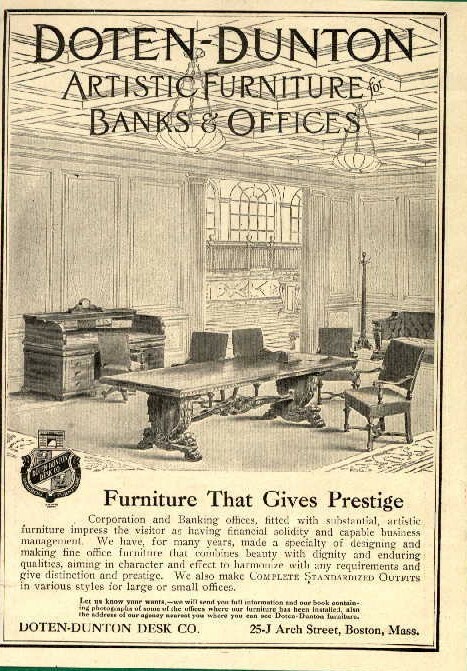 The copy for the ad reads, "Furniture that gives prestige. Corporations and Banking offices, fitted with substantial, artistic furniture impress the visitor as having financial solidity and capable business management. We have, for many years, made a specialty of designing and making fine office furniture that combines beauty with dignity and enduring qualities, aiming in character and effect to harmonize with ant requirements and give distinction and prestige. We also make COMPLETE STANDARDIZED OUTFITS in various styles for large or small offices." 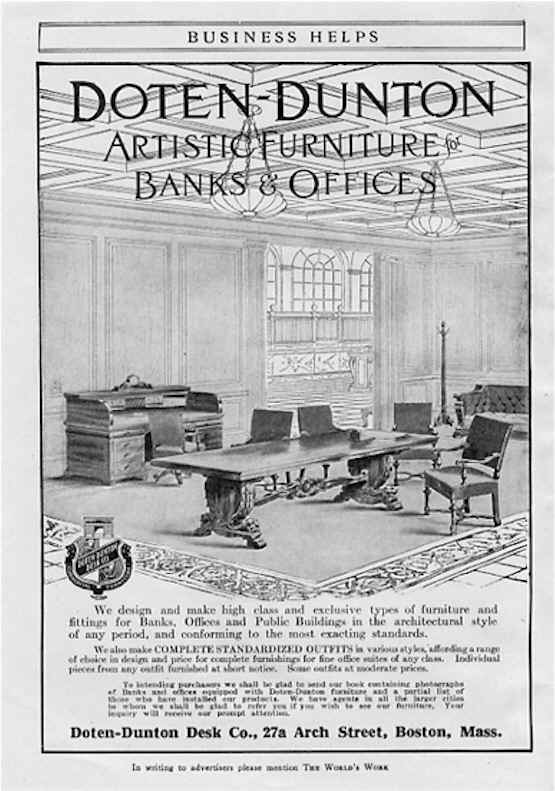 Offered on ebaY in October of 2000 Another 1914 advertisement shows a conference table that will seat at least twelve people . The company address was listed here as 25-M Arch Street in Boston. The advertisement measures approximately 5-1/2 inches by 8 inches. This old book is all leather. 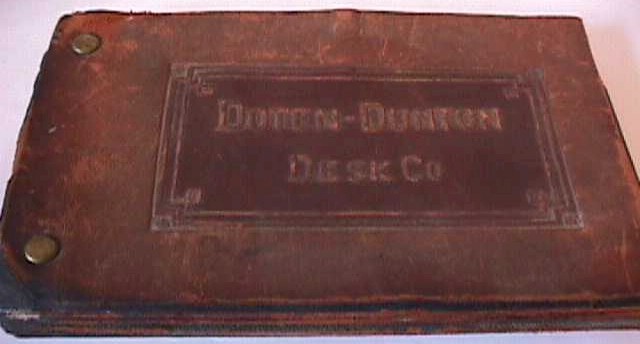 The front is leather and stamped, "Doten-Dunton Desk Co.". The Pages are made up of sixteen individual pieces of leather, each stamped with a number, and country of origin. 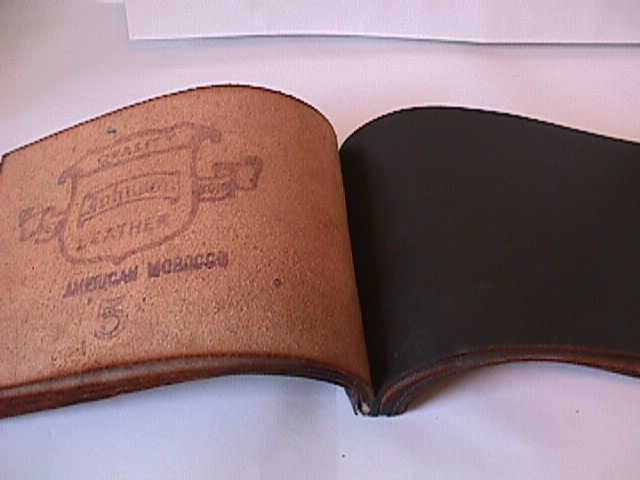 The leather pages are approximately 8-1/4 inches by 5-1/2 inches. If you appreciate this resource and would like to help keep it improving and on the Internet, please consider a financial contribution.